Greek and Roman Mythology will introduce students to the Greek gods and goddesses and to the most important myths and stories from antiquity. 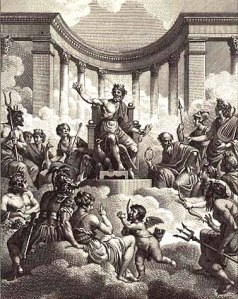 We will explore the Greek and Roman pantheon, Jason and the Golden Fleece, the nine muses, greedy King Midas, and the famous stories of the ancient epics the Illiad, Odyssey, and Aeneid. The class will explore the ancient myths through readings, interactive games, art projects, and group activities. We will also discuss the ways in which the ancient stories have been adapted in modern literature and cinema. Students will have the opportunity to explore a myth of their choosing in-depth and to share it with the class. The class will prepare students who wish to take the National Mythology Exam, given in the spring each year for grades 3-9 by the American Classical League. Students will need to obtain a copy of D’Aulaires’ Book of Greek Myths by Ingri d’Aulaire and Edgar Parin d’Aulaire, and the companion book, D’Aulaires’ Greek Myths, Student Guide by Cheryl Lowe and Leigh Lowe. Light reading and homework will be assigned each week. Enrolled students will have password-protected access to the website, www.classicalprep.com and will be able to view the weekly syllabus, listen to audio readings, watch companion videos, and download worksheets, and use on-line flash cards. It meets weekly on Thursdays @ 11:00-11:55 at LEAD Homeshool in Decatur, Ga. The cost of Mythology is $240 for the semester. Classes start September 6, 2012 and follow the LEAD calendar.